Generally, if you sign up for a web hosting package, email service will be included. But what if your web host doesn’t provide any email hosting services? Or what if you need more than what they offer? In this article, we will go over some email hosting choices available if you need your emails hosted separately from your website. We will also show you how to set up email-only hosting with Doteasy. Email hosting: what are your choices? Regardless of which option you choose, the setup is simple – all you need to do is update your domain’s MX records to route your domain emails to your new email service provider. This might sound complicated, especially if you are doing this for the first time, but it’s not that difficult. There was a time when you can set up up to 10 free domain email accounts with Google using Google Email Apps. However, since October 2015, Google Apps is no longer free – entry plan costs $5 per user per month. If you want to route your domain emails to your Google Apps account, you can check out our article Setting up your domain email with Google Apps [link to article: Setting up your domain email with Google Apps]. If you already have an Office 365 subscription, you can use Exchange Online to access your domain email accounts. Just like Google Apps, Office 365 is a paid service, starting at $5/month per user. If you want to route your domain emails to your Office 365 account, you can check out our article Accessing domain emails with Office 365 (Exchange Online). 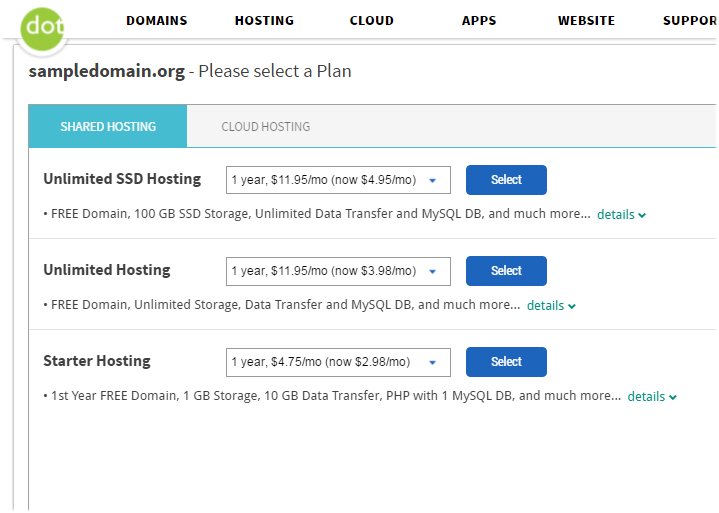 Even though Doteasy doesn’t offer any email-only hosting plans, you can still sign up for a web hosting package and simply just use the email part of the plan. Common situation: Many website builders do not offer email hosting services. For example, if you are using Wix or Squarespace to create your website, you would have already noticed that you need to use an external (paid) email service provider. In this case, you can consider using Doteasy as your email hosting provider. Doteasy web hosting packages start at $2.98/month and comes with hosting services for both your website and domain emails. Plus, all Doteasy web hosting packages include FREE drag-and-drop website builder services powered by Website.com. If you want to use just the email part of the package, then all you need to do is change your domain’s MX record and route your domain emails to your Doteasy hosting account. Go to our homepage, www.doteasy.com and click on Sign Up. On the Web Hosting & Domain Name Sign Up page, click on the User Your Own Domain Name link. 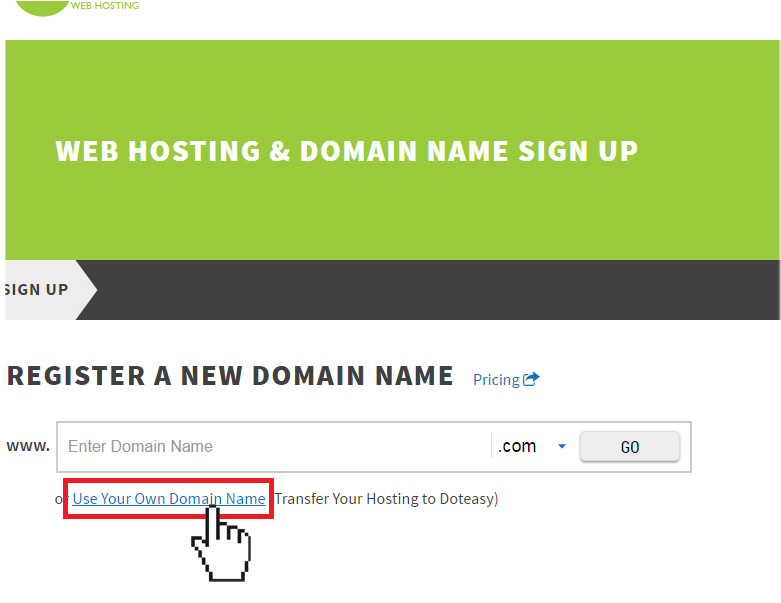 Enter your existing domain name (that’s the domain that you want to route to Doteasy for email hosting services). As part of the signup process, you will be asked if you want to transfer the domain name to Doteasy as well. If you want to keep your domain management (including domain renewals, registration records, etc.) with your existing domain registrar, then select the No, keep the domain name with the old domain registrar option. 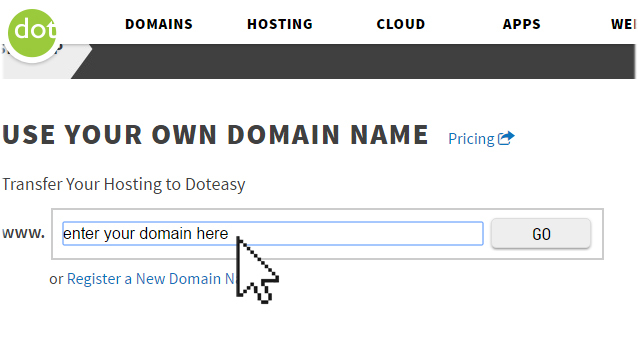 If you want to transfer the domain over to Doteasy for easier, centralized management then select the Yes, transfer [domain name] to Doteasy. In addition to a centralized management of your domain, when you transfer your domain name to Doteasy, your domain will be renewed for 1 year at our discounted rates. Next, you will need to select your web hosting plan. Both the Unlimited SSD Hosting and the Unlimited Hosting plans come with the capability to create unlimited domain email addresses. The Starter Hosting plan comes with 10 domain email addresses. All three plans come with POP3, IMAP, SMTP and webmail access as well as email forwarding and email auto-responders. Proceed with the rest of the signup process, including setting up an admin username and password, and providing your payment information. Once your signup request has been submitted, your Doteasy hosting account will be created and activated. Our auto-system will send you an email containing the DNS changes you need to make to complete the account activation. DO NOT make the suggested DNS changes if you are only using the email-part of your Doteasy hosting account – doing so will route both your email and website to Doteasy. Instead, once you have received the email notification, contact us for your account’s MX records. A MX record is a record in your domain’s DNS that specifies which mail server is responsible for your domain emails. Once you have received the new MX records from our Support Team, login to your account at your domain registrar (ie. the company where your domain is registered) and make the MX records changes via the DNS panel. If you need assistance with making the MX record changes, don’t hesitate to let us know. We will gladly help you.